Whenever the word sequel comes to mind, I know a lot of people often cringe. More often than not, people only have one question about sequels: how will it measure up? Sequels – be it in books or movies – are either a hit-or-miss, usually because of the high expectations set by its predecessor. Will the sequel live up to the fans’ expectations? Will it be everything that we loved in it and more? Or will it just disappoint? 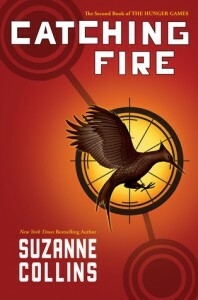 Catching Fire by Suzanne Collins is one of those sequels. Released a year after The Hunger Games, Catching Fire was one of the most anticipated books to be released in 2009. While other fans who got the first book when it was released had to wait a year before they got to read it, I was lucky enough to be able to get a copy of Catching Fire at the same time that I got The Hunger Games. Call me a late bloomer, I guess, but it was a blessing in disguise because even if the first book didn’t end with a huge cliffhanger, the waiting time was reduced and I could just get into the action immediately. If you haven’t read The Hunger Games, then this spoiler warning is for you. Catching Fire starts with the heroine Katniss Everdeen preparing for the Victory Tour with her fellow tribute Peeta Mellark after winning the 74th Hunger Games. Katniss thought winning the games would bring her life back to normal, but instead, it changed everything: Peeta remains cold to her after he found out that Katniss was just playing their romance for show, and her best friend Gale is aloof with her for reasons he knows why. Unknown to Katniss but revealed soon after, her final act at the Hunger Games that meant to save herself and Peeta has fueled the unrest in the other districts, and these rebels have made Katniss the symbol of their rebellion. Just in time for all this unrest is the 75th Hunger Games that is also the Quarter Quell: the rules of the games are changed, raising the stakes higher to remind Panem – and ultimately, Katniss – that the Capitol still owns them, no matter what. I really didn’t have much doubt that Collins would deliver a great sequel, especially after some of my bookish friends have praised Catching Fire, but I tried to keep my expectations down as I read the book. I think that might have helped because, personally, I thought Catching Fire was all kinds of awesome. Katniss is back, and she was still as great as she was in the first book, fighting against fear and the people that threatened the safety of her family and friends. I liked Katniss more in The Hunger Games, but the sequel shows us a different side of Katniss now that she is thrown into a situation she did not expect would happen if she won the Games in the last book. Her confusion and fear is palpable, and I liked all the moments when she found strength somewhere in her to protect the ones she loves. It’s almost like a maternal instinct, which I wouldn’t doubt if it is given that she practically raised her family after her dad died. Katniss is still surly and not too charming here despite how she was being packaged to Panem, but she is still that same protagonist that fans of the first book would definitely root for. This book also gave us more of a glimpse of the people around Katniss, particularly the two guys in her life, Peeta and Gale. In Hunger Games, there was more screen time for Peeta that people tend to gravitate to him instead of Gale. In the sequel, Peeta still gets more screen time but we get to see more of Gale, as much as Katniss sees him, anyway. Here we see and understand a bit more of Katniss and Gale’s relationship, as well how Katniss depends on Gale. It’s kind of hard to read Gale here at first, but we get a glimpse of how he has been hardened by what he has went through, and even more after what his best friend (and love, perhaps) has gone through. Peeta, on the other hand, really becomes the golden boy here, by the way he manages the pressure and invisible (at least to him in the early story) threat to Katniss. Later, he becomes the “most” protected, which puts him more on spotlight — again. No wonder more people liked Peeta. :P These two boys provide good contrast over Katniss’ character in the story, and set the dynamics of their relationships is what set the scene in Catching Fire. These boys aren’t perfect, which is a breath of fresh air from all the seemingly perfect YA male leads. But I think the real star of this novel in my opinion is not Katniss or Peeta or Gale, but the Capitol. All throughout the novel, I was trying to think of a justification why the Hunger Games was happening, specifically, why there was a need for a Quarter Quell. I know it’s already been introduced in the first novel, but the cruelty of the Quarter Quell just seemed too senseless that there has to be some kind of good reason why they had to do it. Perhaps I was just being naïve, but I wanted to find something good in the Capitol, to give some kind of justification for this…horror. But as I continued reading, I am always struck by how evil they really were, how senseless the games really were. This realization made me not only really hate the Capitol (and President Snow as the face of the Capitol) but also understand what The Book Smugglers said about dystopian novels having one unifying factor: the Truly Villainous Government. Think your government is bad? Wait till you live in Panem.